BVSA HONDURAS: YEAR-END NEEDS / CHRISTMAS WISHLIST - bvboys's JimdoPage! 2018 was an incredible year in Travesia, Honduras! We re-opened the academy in April and did our best to make our first year a successful one. It was both challenging and rewarding! We are thankful to be making relationships with these special boys. Now, as the new year approaches, we are in need of some necessary equipment & supplies in order to be ready to start year 2 the right way. We could use some help. If you would like to help, click the "Donate" button to the right of the list. Thank you for your love and support in bringing the hope of Jesus to the village of Travesia, Honduras! 2. Reversible training jerseys: $400/RECEIVED - THANK YOU! 3. Soccer balls for the year: $300/RECEIVED - THANK YOU! 4. Tennis shoes for indoor training/conditioning for 18 boys: $400/RECEIVED - THANK YOU! 6. Cleats for 36 boys: $1,400/RECEIVED - THANK YOU! 7. Soccer equipment for practices (ladders, cones, posts): $300/RECEIVED - THANK YOU! 8. Netting for field: $600/RECEIVED - THANK YOU! 9. Supplies for classroom (books, workbooks, pencils, etc): $250/RECEIVED - THANK YOU! 10. Lawnmower to maintain the field and entire property: $350/RECEIVED - THANK YOU! 11. Commemorative plaques & trophies: $350/RECEIVED - THANK YOU! 1. Rhinos Graduation Ceremony & Family Christmas celebration - $475/RECEIVED - THANK YOU! 2. Rhinos Christmas Party, dinner, gifts, etc - $375/RECEIVED - THANK YOU! 3. Annual Rhinos Cup, flags and trophies - $260/RECEIVED - THANK YOU! 4. Year-end Staff Christmas Party (includes staff and supposes/families) - $220/RECEIVED - THANK YOU! 5. Year-end Awards, trophies and individual team photos - $200/RECEIVED - THANK YOU! 6. Rinas (girl's team) Christmas party, lunch and gifts - $80/RECEIVED - THANK YOU! 7. Commemorative plaques for 2018 Rhino Graduates - $60/RECEIVED - THANK YOU! 8. Buena Vista plaza decoration - $40/RECEIVED - THANK YOU! 9. Uniforms for 2019 (jerseys, shorts, socks, shin guards) - $1,500/RECEIVED - THANK YOU! 10. Indoor Cleats for 2019 - $1,400/RECEIVED - THANK YOU! 11. 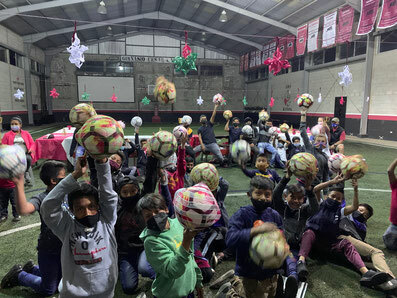 Soccer balls for 2019 - $200/RECEIVED - THANK YOU! Each year we have some boys who have unique sponsorship needs based on their situation. This year we have 3 special young men who need could use some help. School for Aldo: After being in the Academy for 2 months, Aldo suffered a terrible accident that resulted in the amputation of his left arm and his right leg. It also left him thankful to be alive, and with heart that accepted God's will for him. He has been an inspiration to everybody who knows him, especially in this village of Buena Vista. He is a true miracle to all of us in faith. Such an important part of his recovery has been the support of friends like you. He and his family can’t express how much it has meant for them and how it has given Aldo his dignity back. Almost 2 years later, he wishes to go back and finish his last year of High School. He would be going to C@B DeepStream, which is the school that our friends and fellow missionaries Mark and Gina Schmidt oversee. If you want to help by supporting Aldo with his last year of High School, the total cost for 2019 is $1,100. UPDATE: RECEIVED - THANK YOU!! College for Pablo: At his young age of 17, Pablo has witnessed many of God’s miracles - not only in his own life, but also in the life of his father Cesar and his entire family. They have been blessed in so many ways and by so many of you. He has also been blessed to be part of the Academy even though he is not form Buena Vista. In addition, the rest of the Rinos have been blessed to have him as a friend they can count on, and if you know him you have been blessed by his story as well! Next year, he will join the staff at BVSA (part-time) as he finishes his last year as a Rhino. Pablo's ultimate goal in life is simple - to serve God with everything he has. He would like to continue studying at the University, and major in Computer and Software Engineering. If you would like to bless Pablo by supporting him through his first year of college, the cost for 2019 is $1,400. UPDATE: RECEIVED - THANK YOU!! Continued Education for Wisman: Wisman, aka “Bones”, is in love with Jesus and wants to serve Him with his life. He has been a Rhino since 2015 and is as loyal as they come! He is a hard worker who has learned to put into practice what the Bible says and the advice of his coaches. These characteristics, combined with his love for God, have put him in a leadership position at his local church (which BVSA is now partnered with) in working to bring Jesus to the people of Buena Vista. Wisman recently finished his one-year degree in Graphic Design and would like to continue. You can help him complete his 2nd year of Graphic Design Studies, at a total cost of $500. UPDATE: RECEIVED - THANK YOU!! Or contact us by email with any questions. Please receive greetings from the Rhino Family in Guatemala. Everybody here wants to thank you always for everything you do for each one of us here at BVSA. Your support is what helps us continue in the mission God has put in all of our hearts to do. We also believe that your support is also a mission God has put in your hearts to do, so THANK YOU from all of us in Buena Vista, Guatemala! At the end of this 2018 we celebrate God’s grace in provision throughout all the year! And also ask you to join us in making this celebrations possible to the Rhinos, we think it is a time where they can enjoy being together as a family and have fun. If it is your desire, you can contribute to any of these activities; we have made a list of the ones we have planned and their cost, and are trusting in God’s provision. We would love to be able to do them, you all know how important and how much in means to the Rhinos, but we give thanks to God for what He plans and allows to happen.